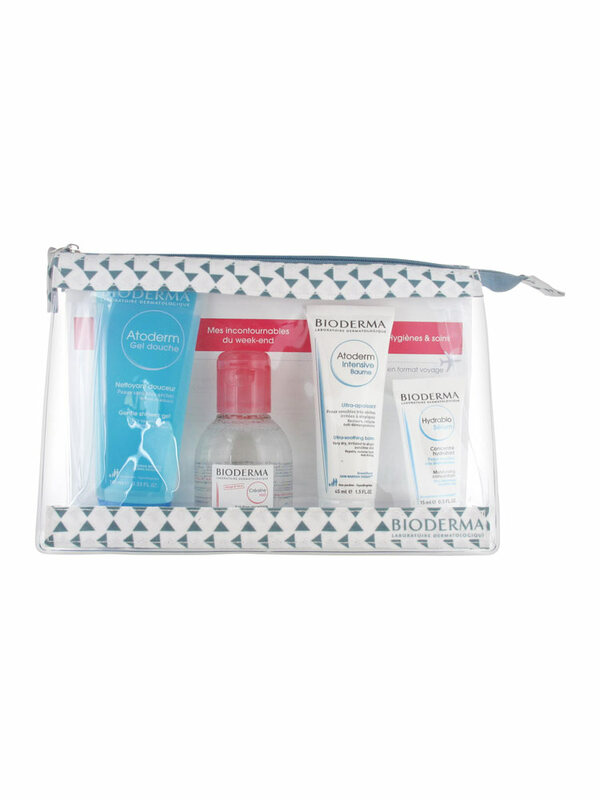 Bioderma My Hygienes and My Cares Set is a set which contains 4 cares in travel size that you will take everywhere with you! - Bioderma Atoderm Gentle Shower Gel 100ml with creamy and fragrant texture is a shower foaming cleanser gel perfectly adapted to the hygiene of the dry and sensitive skins of the whole family. Without soap, the formula with physiological pH of this shower gel contains the patented natural complex DAF which increases the tolerance threshold of the skin. Thanks to its moisturising properties, Bioderma Atoderm Shower Gel softens and protects the epidermis. Its soothing properties reduce the sensations of tightness. - Bioderma Crealine H2O Micelle Solution 100ml guarantees a mild cleansing of face and eyes (eliminates waterproof make up). Micells allow a perfect micro-emulsion of the stains while respecting the cutaneous balance (soap free, physiological pH. Soothing and decongestant active ingredients prevent from sensations of irritation, often linked to cleansing. - Bioderma Atoderm Intensive Ultra-Soothing Balm 45ml is an ultra-soothing and ultra-rich care recommended for sensitive very dry irritated to atopic skins of the whole family (adults, children, infants). - Bioderma Hydrabio Serum 15ml is an intense hydrating concentrate with Aquageium. Antidehydrating. Bioderma Hydrabio Serum offers comfort, suppleness and skin radiance. Fresh and Melty Texture. - Bioderma Atoderm Gentle Shower Gel 100ml Apply to wet skin. Lather and rinse thoroughly. Dry delicately. Face and body. Adults, children and infants. - Bioderma Crealine H2O Micelle Solution 100ml Soak a cottonpad. Pass it on the face to cleanse; Repeat until the cottonpad is clean. Dry by swabing gently with the towel. - Bioderma Atoderm Intensive Ultra-Soothing Balm 45ml Apply once or twice a day on the skin cleansed with atoderm foaming gel. Bioderma Hydrabio Serum 15ml Apply morning and evening on previously cleansed face and neck. Indication: Cares set in travel size. Bioderma is fantastic! My cares set price is very friendly! Thank you. *** good product.